Purple version of Matt's Evolution. This is revision no 4 of the Hellenic translation of Geeklog. I now consider this translation to be not only official but stable. That means, comments on this file will be considered CORRECTIONS for me. Integrated Geeklog Site Calendar. 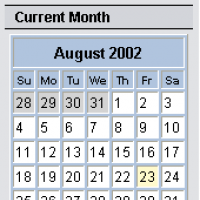 Will show you dates with GL Calendar events and clicking on a date will do an advanced date search for any site changes for that date. 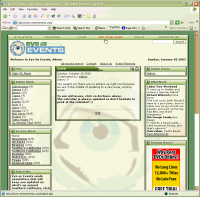 Includes modified search.php for GL 1.3.7 release. This contains ONLY the files needed to fix the security problems in Geeklog 1.3.7. If you were running an older version, please download the complete 1.3.7sr1 tarball instead. This converts a PHPWebLog version 0.5.0 to a Geeklog 1.3.1 compatible database. Completed and working version of the Russian language translation file. The latest in what I'm gonna call the XSeries, XFlame is yet another modification of XSilver, and it's gonna heat things up around here. 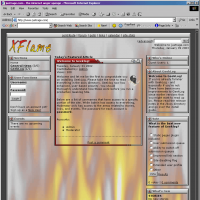 XNature is a modification of the default XSilver theme, based on the popular Glass theme. Note that the images in the snapshot are different from the ones contained in the distro. Enjoy!